You remember the practice when it happened? The practice stopped when he went off with the injury. I doubt it happened later; more likely he played through it until the pain got too bad and they x-ray'd it. It's understandable that Monahan might be more focused on the NHL, and perhaps he should be in his head. That doesn't mean it's the best thing for the player, or that Flames management is paid to think like a 19 year old rookie. Whatever Monahan thinks, there is a better experience waiting for him at the world juniors. Just ask anyone who's been loaned there from the NHL. I agree. I agree, because I think the Calder would be a worthless piece of trash if it didn't take this into account. Off the record, I think it does, and the Flames have severely hurt Monahan's chances of winning it. Huberdeau - won 2012 Calder, played in world juniors. Landeskog - won 2011 Calder...different years, but also played in world juniors. Skinner - won 2010 Calder...missed world juniors playing for US team. Mason, Kane, Malkin, Ovechkin.....Same Thing. 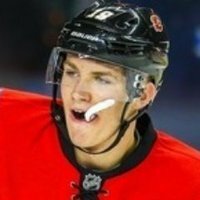 There has only been One Calder winner in the last Ten years that hasn't played in the WJC. And in hindsight, they were also the worst selection of the last 10 years. Call it a coincidence if you dare. Here we are, a Canadian team, holding back team Canada. The decision seems to be based a lot more on Money than it is on Mony. Ridiculous (in my humble opinion, as always). Just gotta say Myres is not an assistant captian nor is he a leader! I have no idea why you would think that. I know he s on a bad team and will probably be a better player in the future but I think you need to watch some Sabres games before you comment on a player because you are way off the mark! So, I realize that he's not currently wearing the A, and that there are some knocks against him. But in terms of relevancy....how pertinent is this to the conversation? Myers >>>>> Skinner. Outside of that, We're getting fairly off track. It's a moot point. You can moan about it all day but in the end, he wants to stay with the big club. Management wants him to stay with the big club and I want him to stay with the big club. First and always I am a Flames Fan! Nothing else comes close. So if I don't want our best young player not playing for Canada, that has nothing to do with my patriotism, or with wanting our team to win. It has everything to do with wanting my team, the Flames to win. Period. I would be more excited if more than one Flames was playing in the tourney. Gillies is the only individual player I will be paying attention to, assuming I have the time available to see the games. I want him to do so well, I will have a hard time cheering TC when they play the US squad. I would prefer that the US is not the team that ends up ousting TC. I'm not anti-Canadian nor pro-American; I want a Flames prospect to win all the marbles. If we had Mony, Klimchuk, and Jano playing for TC, you know I would be pushing for one of them to get the winning goal in the finals. A 1-0 win over the Americans in OT. I am not really impressed with TC decisions overall; some are right and some are typical political decisions. Wow. Okay, well if it comes down to patriotism, which apparently it does, I'm more patriotic about my country than my City. And apparently that's not universal. Which is weird. Did you guys sing the Calgary anthem at school or something? If I was in any other country, I would completely lose it on you guys right now. In many countries, you would be tracked down. But I'm in Canada, and I have Canadian values. And if a business with a red logo means more to you than the mapple leaf...well that's just plain bizarre, ignorant and close minded, but you have every right to think that here and I respect your decision. That, by the way, is precisely what makes Canada one of the best countries in the world, and why I'll be focused on Team Canada come the world juniors (unfortunatley watching other Team's players learn about winning and get an edge on Monahan). The fact that you are allowed to even think the way you do is what makes Canada so special. Then..... why are the Playoffs not interrupted for the world championship? The Schedule recognizes the olympics, but not the worlds. In soccer, the teams have to accept the FIFA schedule and any player requested by the national organization has to be accepted. Using this example would mean Calgary would have to send Baertschi, Hudler or Berra to the world championship, even if we would be in the playoffs. It doesn't matter that the team pays the salary. So for Hockey that is not the case. The goal of any player, playing in the NHL should be the Stanley Cup and it is necessary to sacrifice a lot to get there. For Monahan that is to learn on the NHL and not on the junior level. If Monahan couldn't go to the Olympics I would see a problem, but some junior tournament that happens every year, give me a break. As far as the Calder argument the other night. What if Monahan was injured for the tournament. Does that mean he won't turn into a great player if he wins the Calder and didn't play in the jr tournament? The whole argument of who turns out to be good depending on if they played in the WJC and won the Calder is DUMB! If the player has great skill playing against men he won't lose it just cause he didn't play in a kids tournament. Cant wait to continuously laugh about this when he becomes a cornerstone for our franchise! What if Monahan was injured for the tournament. He's already injured...playing in the NHL? So...I don't follow. When Monahan said his goal was to play for the flames this year, its kind of blatantly obvious that he was comparing his current at the time junior team vs the flames. WJC were not even brought up at the time that was in the distant future, training camp, making the flames roster at the start of the season was his immediate goals. He mentioned what an honor it would of been to wear the Team Canada jersey, and said that the choice was not in his hands. It really is a shame that he couldn't go and represent his country, we have already seen what the team is like without him in the line up it's not that bad and with Gio back there should be no reason we couldn't go without him for a 5-6 game span, for a once in a lifetime event considering every other year he got passed on the team due to little exposure on a craptacular team(?). And with his play with the flames this year he was a lock in. Hes injured now but will be back before the tournament starts. Not missing the tournament because injury. You stated most players who win the Calder played in WJC right? Those who didn't don't develop well (Skinner) right? So if Monahan wins the Calder which is possible and doesn't play in the WJC what is the point of your whole wining the Calder and playing in WJC? Do you really think he won't be a very good player just because of not playing in the WJC? If so, you are wrong and I will laugh at you in the future! Who said that (except for you)? And if a business with a red logo means more to you than the mapple leaf...well that's just plain bizarre, ignorant and close minded, but you have every right to think that here and I respect your decision. It's closed-minded if someone disagrees with your worldview? Ooh, the irony. Not everyone is a fervent nationalist (especially with regard to something as trivial - in the grand scheme of things - as hockey). Get over it. Personally, I would have liked to see Monahan play in the World Juniors. It would have been fun to watch, and I think it would have been good experience. And I think development should come before winning this year for the Flames (to an extent). That said, I'm not heartbroken that he's not going, especially considering the injury situation, which complicates things. And I think that people who are making this out to be a serious blow to his development are really being overly dramatic. It probably would have been good experience, but it's by no means a make-or-break thing. You keep talking about him being injured in the NHL. He was injured at a Flames morning skate, where he was hit in the foot by a Wideman shot. Maybe he shouldn't attend practices because it is not safe there. You think it is any safer in the WJC, practice or real games? Ask Sven how safe he was there. A lot of teams have players that aren't playing in NA, and could care less about laying a hit or slapping the puck off some guy's head; they will never be pro hockey players. The injury side of the decision was a team protecting its assets. He could end up like Seilof and miss a bunch of time after a "routine" injury due to complications. No doubt the Flames don't want any risk like that. JJ as usual, you completely missed my point. You brought up the idea if we don't cheer for our national team, then we should never talk about winning or some such crap. Not sure as you seem to ramble on at times. My point was, I could care less about the junior worlds. I want our best players wearing the flaming C. Not playing in some tournament that happens every year. I honestly can't tell you who won last year and I really don't care. As I mentioned in another thread, unless it's the Olympics, if the Flames are not playing, I don't watch hockey. You can go on and on all you want about this, but like I said, decision is made. Done. Over with. I assume Monahan doesn't get paid if he goes to Sweden. Missing 5-6 games means he loses $50-60k, which is more money than the average Canadian earns in a year. I doubt he wants to go to this tournament instead of playing in the NHL. I really doubt that. Winning a medal for your country is huge, more than $50k to a guy that's already a millionaire. This is a historic moment where we agree, geos. I always believed that, faced with a truely mind-numbingly pathetic arguement so counter-intuitive that most household pets would shake their head...that we could find common ground. It looks like that dream has finally been realized. The arguements on here for keeping Monahan out of the WJC vary between weak and pathetic. With the one you responded to being on the extreme lower end of that range. hint....absolutely, when something doesn't make sense, money is involved. But we're talking about a Lot more than 50k, and we're not talking about Monahan's paycheck. We're talking about the Flame's revenues, and NHL expansion revenues. The fact that much of the (Sportsnet/Flames affiliated) media agrees with keeping Monahan out of the WJC is just a further embarrassment to the cause. I swear many of the "thoughts" on here are word-for-word dictation of AM 960 in the morning. Just because you heard something on your way to work (or junior high, for that matter) doesn't make it "your thoughts". What I thought was the worst arguement I've heard on here is that it will help him win the Calder...and I think it's a popular one. I rebuffed it, and the board literally went dead. Now I'm seeing a whole new generation of absolutely brutal arguements (such as the one you responded to) that I am convinced are 95% dictations and recaps of cheap media quips...possibly, in fact, just one radio talk show host). And, of course, those who just repeat everything Feaster says. For someone to say anyone who doesn't want him to play in the WJr team are unpatriotic lol......... talk about weak arguements. I sort of understand your stance because aren't you the one who claimed he gave up his NHL seasons tickets and prefer to watch only minor hockey now? However you are getting in a big huff over a Junior tournament you obviously care about watching that is more hype than anything else these days. The only trouble is you don't seem to care enough about this topic to even put in a no vote in the poll. Then again not one single person has voted no, so I gather no one really cares that he will likely get held back from this tournament, and now it seems they are arguing for the sake of arguing. Please have a look at the question (which you've covered up) in that poll. I just think Monahan will be a great player juniors or not. If he wasn't off to such a great start he would be there, but I don't think its gonna hurt his development. Monahan staying just so he can win the Calder I don't agree with and its somones opinion so be it. I highly doubt we kept him around just for a chance to win a rookie trophy. Personally I could care less about the Calder. He will have a great future with our team . I dont wanna argue with anyone, this is just what I think. The question was should he stay in the NHL. Everyone said yes except 3 who were undecided. I have no problem assuming that all those yes votes feel that the NHL is the best place for his development. So where are the "No Votes" who feel he should be tearing it up with other Juniors? Seeing as the next level up from Junior Hockey (AHL is not an option) for him? Beating Slovenia/Slovakia/Germany/France/Ukraine/Kazakhstan 15-0 isn't going to help Monahan's development. Didn't Shattuck's St. Mary's send some overage players a few years ago? Maybe Monahan could go back to high school and be the MVP at the Mac's tournament. I have no problem assuming that all those yes votes feel that the NHL is the best place for his development. A few of us qualified saying yes to the NHL as it was better then the OHL but that we wanted him in the WJC.